The gut microbiota structure, dynamics, and function result from interactions with environmental and host factors, which jointly influence the communication between the gut and peripheral tissues, thereby contributing to health programming and disease risk. Incidence of both type-1 and type-2 diabetes has increased during the past decades, suggesting that there have been changes in the interactions between predisposing genetic and environmental factors. 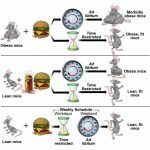 Animal studies show that gut microbiota and its genome (microbiome) influence alterations in energy balance (increased energy harvest) and immunity (inflammation and autoimmunity), leading to metabolic dysfunction (e.g., insulin resistance and deficiency). Thus, although they have different origins, both disorders are linked by the association of the gut microbiota with the immune–metabolic axis. Human studies have also revealed shifts in microbiome signatures in diseased subjects as compared with controls, and a few of them precede the development of these disorders. These studies contribute to pinpointing specific microbiome components and functions (e.g., butyrate-producing bacteria) that can protect against both disorders. These could exert protective roles by strengthening gut barrier function and regulating inflammation, as alterations in these are a pathophysiological feature of both disorders, constituting common targets for future preventive approaches. 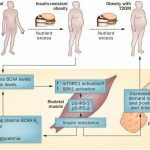 Main mechanisms of action of gut microbiota and derived metabolites in obesity and associated metabolic dysfunctions (insulin resistance and type-2 diabetes). Gut microbiota contributes to the hydrolysis of complex polysaccharides from dietary fiber, and thereby might contribute to increasing energy harvest and to generating short-chain fatty acids (SCFAs; acetic propionic and butyric acid) that affect the host’s metabolism in different ways. SCFAs might activate the G-protein coupled receptor (Gpr) 41 inducing the expression of peptide YY, an intestinal hormone that influences gut motility, increases intestinal transit rate, and reduces energy harvest from the diet. SCFAs might also activate Gpr43 and Gpr41 inducing glucagon-like peptide-1 (GLP-1) secretion, increasing insulin sensitivity, and inducing satiety. Butyrate provides energy to enterocytes, exerting a trophic effect and inducing the synthesis of GLP-2, thereby strengthening the gut barrier function. Butyrate may also promote the formation of peripheral regulatory T cells (Treg) by its ability to inhibit the histone deacetylases 6 and 9 that leads to acetylation of histone H3, which promotes the expression of the Treg-specific forkhead transcription factor FoxP3. 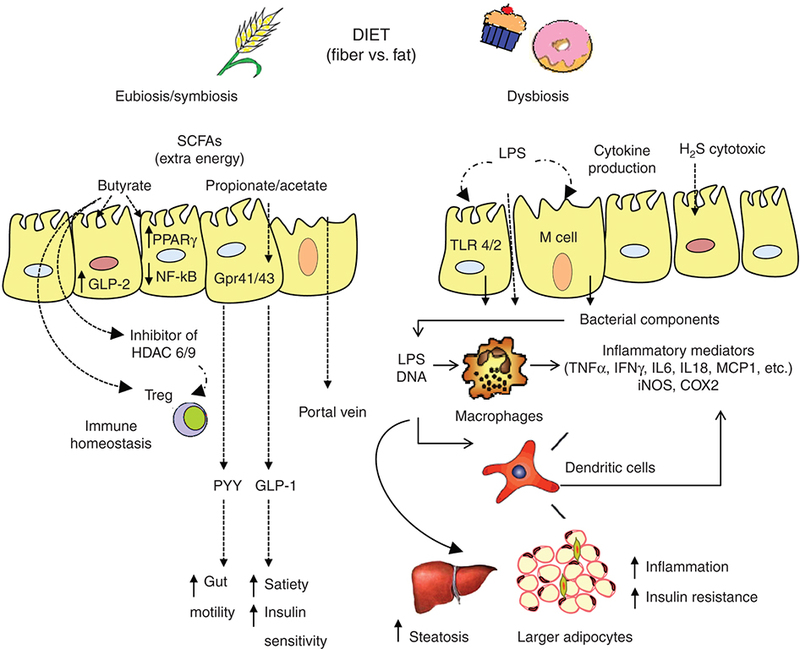 Intestinal dysbiosis, which could be partly caused by “obesogenic” diets rich in saturated fats, may lead to the growth of potential pathogens (Gram-negative bacteria and derived lipopolysaccharide (LPS)) with proinflammatory effects via generation of cytotoxic compounds (H2S) or interaction with innate immune receptors (TLR4, TLR2) and contribute to inflammatory cytokine production, attraction of inflammatory cells, and translocation of bacterial products (LPS, DNA) by transcellular and paracellular pathways that activate inflammation in peripheral tissues. NF, nuclear factor.